Family is the basic structure and unit in Sikhism. It is a strong and noble Sikh institution. Family was most important to all the Gurus who preached life of a householder rather than of renunciation. The Gurus believed that the family must procreate and continue the existence of the society. The family has economic and educational functions to perform so that family life becomes smooth and happy. Sikhism teaches the followers to build a social structure on the basis of universal brotherhood, love for each other, equality, fraternity and Sarbat-Da-Bhala. It believes in individual as well as collective prosperity. It preaches that the human beings are sons and daughters of the same universal father (God). All of them have the same aim of realizing the ultimate Reality. Human race is one. Sikhism recommends an active life in which family has a great role to play. Life of a householder is the best institution to fulfill the Sikh ideal of contributing to the development of the human society. Here the children learn to know the individual as well as the corporate Code of Sikh Conduct through this institution. 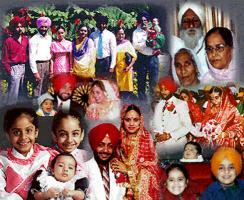 Family in Sikhism is a training school for social, cultural, political and spiritual makeup. It is a training school for Seva and charity. From the family of birth, the religious and ethical ideas are implanted in the child. It is worth to mention here that Bhai Mani Singh took all the traits of sacrifice from his forefathers. Guru Arjan Dev Ji implanted the spirit of sacrifice in the wider family by offering his life to upkeep righteousness. The Sikh families believe in monogamy. The marriages are normally arranged by the parents with consent of the children. Extra-marital and pre-marital relationship is not allowed in Sikh families. Marriage is considered to be a sacrament. According to the concept of Lavan (Marriage hymns), divorce is not encouraged in Sikhism. It is expected of the couple to help and support each other in the family to attain God. Sikhs believe in Nam Simran while living a family life which has all the elements of love, optimism, laughter, pride, pity, joy, gratitude, respect, purity, service and sacrifice. The concept of family life teaches to love and respect the parents, grand parents and society at large. It cares for the vulnerable. It provides psychological foundation for the future and helps in improving the quality of life. It provides emotional care for its members and opportunity to practice democratic decision making. Sikh family preserves human values, cultural identity and historical continuity. Those who live in the situations of God loving families, carry with them into society an urge to strive, the ability to work toward an ultimate goal to attain God, an acceptance for the opinions and defects of others, responsibility, good judgment, sense of kinship plus an unshakable belief in the benefits of sharing and co-operation with human beings. All of these family values are needed in to-day’s world. The Sikhs usually live in extended and joint families under one roof. The parents and grand parents take care of their children and grand children. The members of the family help each other economically, socially, psychologically and spiritually. The children are molded in godly crucible by the parents who take all the possible measures to develop their personality according to Sikh values of culture and religion. The children learn from their families about the concept of universal brotherhood and desire to progress as a world unit by praying for universal welfare. Bhai Gurdas has given an interesting account of a daughter in law who misguides her husband, motivates him to abandon his parents as if they were the deadly enemies and makes him agree to live separate from them. The husband is mislead, leaves his parents, forgets their kindness and starts living away from them. According to Sikhism, the concept of family values is the only way to attain prosperity and world peace. The western world which lost this concept is thinking to bring back family values and lead a harmonious life. The family values in the broadened sense are needed to save the world living under pain and frustration. There is a saying in India, “Old is gold” but this term is interpreted otherwise in western world. The seniors are treated differently in various cultures. The Seniors or grand parents have a great role to play in make up of the good families. They are head of the families. They have got experience of life. They have gone through the ups and downs in life. They are the people to pass on to the future generations the values of religion, history, culture, society and their heritage. They are always seen energetic and doing some or the other thing in Indian society unlike sitting in the rocking chairs. Many a times they work as family counsellors or volunteer professional consultants in the society. They are successful mentors in many families. The grandparents can be supportive of their married children. These are often the grandparents that tell the night stories which develop an increased sense of familial, social, cultural, historical and religious heritage in the children. Moreoften, these days, the young parents want their parents to approve of the way they raise their children. Such suggestions sometimes are considered as criticism which prove to be most devastating. Simulteneously it may be kept in view that grandparents do not have evil motives. Many grandchildren confide more in their grandparents than in their own parents.Children learn the most important things about themselves from the grandparents. Grandparents have bigger lap than the great seas but sometimes the grandparents are accused of spoiling the grand children by raising them in the old fashion or by giving them gifts or being permissive or being too much generous. The Bible says that too much of even a good thing can be taken as bad. Some grandparents complain that they are simply kept in the houses as captives to do baby sitting only. Grandparents and grandchildren often enjoy a special bond. The grandparents many a times influence future of their grandchildren. An ancient proverb says, “The crown of old men is the grand children”. The grand parents have years of parenting experience under their belts. Having learned from their mistakes, they may be more competent in handling children than they were when they were younger in age. The grandparents bequeath a legacy of happiness, emotional health, increased sense of well-being and morale that benefits everyone in the family and society at large. There is always a payback reward for raising a good family and a nation of outstanding vision. Grandparents are blessing in disguise. They are source of love and effection. They are unselfish and sincere when dealing with their grandchildren. They must be respected so as to continue burning of the heritage flame of langfuage, religious, social and cultural values passed on to them from time to time by their ancestors. The grandparents have their duty and let them perform it. Life is not very kind to senior citizens in foreign countries due to role reversals. In the traditional family hierarchy, the parents are recognized as head of the family. They are treated with great respect in Indian society and have the highest authority in the family. The head of family is always consulted in all the matters and he has the final say. The mother looks after all the household affairs. She is treated as queen of the home. She represents and fulfills the social obligations of the family including childbirths, weddings, funerals and so on. This role of authority and respect diminishes and reverses when the parents immigrate to the foreign countries. Role of family hearty is reversed altogether. Their children make all the decisions regarding properties, household and financial affairs. The parents do not get proper diet as they had been enjoying in their back home countries. The parents feel they have been failure. The children remain busy in pursuing their own ambitions and goals. The elderly people are bound at home with household and child caring responsibilities. Their caregivers neglect all the needs of the elders so much so that the money with the parents is many a times grabbed by their own children. For those who are not bound at home with such responsibilities, they are bound by lack of language, skills, money, transportation and knowledge to integrate into the new culture. They cannot socialize or enjoy the company of others. Many of the elders waste their time in Gurdwaras in gossiping, slandering or backbiting while others linger aimlessly in the local stores, malls or loiter aimlessly on roads where they are often slurred by the racists. The parents who once were on top of the hierarchy of the family in their home country become miserably dependent. Their dreams and idealism of uniting with their family in a rich country are shattered. The role of dependency has a devastating effect on their self esteem, self confidence and mental health. They feel small, degraded, inferior, useless and dependent upon their children. They become vulnerable to abuse. They remain virtually immobile in their dingy basements. They do not talk to others about the abuse as the family pride and honor is always kept before personal health, happiness and well-being. They believe that such information may bring shame and humiliation to the fair name of their family. The unexpected loss of status leads to demoralization and frustration.